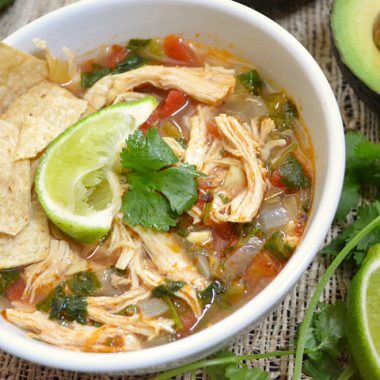 This Chicken and Lime Soup is light, fresh, and flavorful with shredded chicken, vegetables, and a tangy lime infused broth. Add the chicken breast, chicken broth, canned tomatoes with chiles, oregano, and cumin to the pot. Bring the whole pot up to a boil over high heat then reduce the heat to low, place a lid on top, and let simmer for one hour. Rinse the cilantro and then roughly chop the leaves. Add to the pot, give it a quick stir, and serve. Dice the avocado and add a few chunks to each bowl. *I use Better Than Bouillon chicken soup base to make my broth because it is less expensive than buying canned or boxed broths. 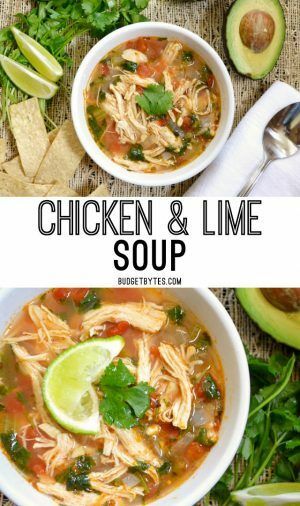 0 Response to "CHICKEN AND LIME SOUP"